This article will comply with UKSF Disclosure Policy. As such, details of operations and training will not be revealed in this article in order to comply with this policy. Opportunities exist for members of the UK military to serve in the United Kingdom’s Special Forces (UKSF). The primary route into UKSF for British Army and Royal Air Force (RAF) personnel is with the Special Air Service (SAS) or Special Reconnaissance Regiment (SRR) based at Hereford. The primary route for Naval Service personnel (i.e. Royal Marines (RM) and Royal Navy (RN)) is as Swimmer-Canoeists (SCs) with the Special Boat Service (SBS) based at RM Poole in Dorset. However, opportunities do exist for Naval Service personnel to serve with the SAS and SRR, and Army and RAF personnel to serve with the SBS. Despite the potential for crossover, the SAS mainly consists of ex-Para’s and the SBS of Royal Marines. SRR employs personnel from a variety of cap badges; however, the SRR is a Tier 2 unit not a Tier 1 like the SBS/SAS. The SAS/SBS as part of UKSF, within the Directorate of Special Forces, provide the UKs immediate response Military Counter Terrorism (CT) and Maritime Counter Terrorism (MCT) teams. During peacetime, overseas deployments for training are frequent though usually of short duration; this is balanced by greater stability for families who are able to remain in the Hereford or Poole areas. It must be emphasised that a candidate must be physically fit at the beginning of the UKSF Selection course if they are to stand any chance of success. The course requires far greater expenditure of physical energy than is normally required in other peace time training. It is essential that candidates arrive fully fit, carrying no injuries and with a sound grasp of basic navigational techniques. The aim of this article is to describe the fundamental entry requirements, selection process and general conditions of service for personnel seeking to serve in UKSF. In accordance with current Government policy on the employment of women in the UK military service in the SBS and SAS is only open to male volunteers. However, appointments do exist for females within the UKSF Group, such as the SRR and as support staff. On 08 July 2016, the MOD announced that all Ground Close Combat Roles (RAC, Infantry, Royal Marines and the RAF Regiment) would be opened to women by 2018 (British Army, 2016). However, no mention was made regarding the SAS or SBS. Special Forces, as opposed to Elite Forces like Paratroopers and Royal Marines, are characterised by the determination of each individual to carry through with the mission even if they be the last one standing. There is a presumption that personnel recommended for UKSF Selection are already very good team players, and as a result UKSF Selection courses are far more individually demanding than for example the Parachute Regiment’s ‘P Company’ or the Royal Marines All Arms Commando Course. Emphasis is on endurance and long, dark hours undertaking solitary, arduous and often seemingly impossible or even pointless tasks. The instructors provide no encouragement or motivation (positive or negative) to aspirants. Officers also undergo a special week of individual tests of determination and planning ability mixed with sleep deprivation and diversionary tasks, their efforts often cruelly judged by the SAS senior NCOs to whom they have to deliver their Orders. The SAS and SBS (and SRR to some degree) have joined forces to combine their main initial selection process, culminating in a week of increasingly more gruelling marches carrying full equipment over the wet, inhospitable Brecon Beacon mountains’ of South Wales. Assessment continues long after selection is completed, as personnel are expected to improve in the job. Remaining in a SF unit can be more difficult than getting there in the first place! Unlike most training courses in the UK military, UKSF Selection has a ‘select out’ policy rather the norm of ‘train in’. Volunteers for UKSF Selection may be accepted from any part of the UK military (including the Reserves) to serve with the SBS or 22 SAS. Volunteers who wish to serve with the SBS are known as SBS Volunteers and those wishing to serve with 22 SAS are known as SAS Volunteers. Commanding Officers (COs) may not withhold applications on manning or structural grounds. Capable of passing the British Army’s Basic Combat Fitness Test (BCFT). Other ranks volunteering for service in the SBS or 22 SAS should be aged 32 years or under on the date of UKSF Selection Course Assembly. There are exceptions to this rule and those beyond this age should write to the Officers Commanding (OC) Training Wing SBS or OC Training Squadron 22 SAS, who will make a decision on a case-by-case basis on an individual’s suitability for service. All volunteers should have completed a minimum of two years service. This excludes Phase 1 (initial) and Phase 2 (employment) training at any of the other ranks training centres/regiments or schools prior to duty. Capable of passing the BCFT. Be discharged until the completion of 3-years service from Admin Day (Section 4.4). If during subsequent training and before being posted as trained SAS/SBS officers/soldiers an individual fails to reach the required standard, the restriction of their rights will be cancelled. Candidates should have a minimum medical classification as per JSP 950 ‘Medical Policy’ (published 01 April 2011, formerly JSP 346). Candidates should also refer to the relevant DIN (Defence Instructions and Notices) as published by the Sponsor Branch (HQ Directorate of Special Forces). In addition to the above, volunteers for SBS are required to have a Full Service Diving Medical and Full Plate Chest X-ray before attending a Special Forces Briefing Course (Section 3.2). The relevant Service manning agency will forward the candidate’s application with supporting documentation to the OC 22 SAS Training Squadron for SAS candidates and to OC SBS Training Wing for SBS candidates. UKSF Selection is the selection and training process for candidates wishing to join the SAS or SBS (and, it is believed for some elements, from April 2005 the SRR). Until the late 1990s candidates for the SAS and SBS underwent selection under the auspices of their prospective units; merger created efficiencies and encouraged a greater degree of interoperability between the two units. Now candidates, of both the SAS and SBS, undergo a common selection process up to the award of the sand-coloured (beige) beret. SRR Candidates “undergo an initial assessment before being called for a gruelling eight-week selection process involving physical, mental and ­academic tests undertaken at remote bases on Dartmoor, in Wales and Scotland” (Giannanegli, 2012). An article in the Scotsman (2005) states: “Although the early phases of training will be based on the SAS selection process, the main training will be very different.” The two selection processes share some relevant aspects such as SERE Training (Section 5.3). As the name suggests, SRR is a reconnaissance unit and so their training differs from conventional SAS irregular warfare and counterterrorism disciplines. Selection is reported to be one of the most demanding military training courses in the world, with a reported overall pass rate of less than 10%, and is held twice a year (a summer course and a winter course) regardless of the environmental conditions. It is a test of mental and physical strength, endurance and resolve over the Brecon Beacons in Wales, and in the jungles of South East Asia. Candidates are limited to a maximum of two attempts with candidates failing being returned to unit (RTU); during the selection process candidates are allowed one red – you can fail one task but on the second red you are out). UKSF Selection, like all UK military courses, has evolved over the years. And, although the Aptitude Phase of training has not changed since the 1950s, the other phases have been adapted due, for example, to lessons learnt and doctrinal changes. As such, the exact make-up of UKSF Selection has gone through a number of iterative guises with examples given in Figures 1-3 below. The course details outlined in Part Three are based upon Figure 3. The SBS, SAS and SRR conduct a number of briefings to units designed to inform candidates about service within UKSF. Furthermore, both the SBS and SAS sponsor individual training courses designed to assist individuals with their personal preparation. These courses are not ‘pre-selections’. In addition candidates for SBS will be required to undertake a 5-day aptitude course to assess their suitability for diving and operating in a maritime environment. It is important that candidates attending UKSF Selection ensure they have ‘adequately’ prepared themselves, both mentally and physically. Although passing Selection is the goal of all candidates, how each candidate trains to achieve this goal will be different. For example, some candidates will travel to South Wales and train on Pen y Fan prior to attending UKSF Selection. However, for many this will not be possible due to work commitments and location. In this case candidates may prefer to procure a large square piece of wood and perform ‘step-ups’ with a loaded pack. Whatever training method a candidate chooses they will have to ‘put in’ many hours and a fair percentage of training will require loaded marches with heavy packs. UKSF Selection aspirants are strongly encouraged to attend and take advantage of the pre-selection preparation outlined below. Presentations on the organisation, role and training of the SBS. Advice on preparation and training for UKSF Selection. Assessment of individual levels of robust fitness and navigational ability. Conduct of UKSF swim assessment and SBS dive acquaints. An individual interview will include advice on the recommended Selection course that should be attended, career implications of a tour with the SBS and pre-course preparation advice. Officer career advice and estimate revision. Pre-course administration: SBS aspirants, both officers and other ranks, are required to attend an administration week, at RM Poole, one week prior to the commencement of the UKSF Selection Course. This is to ensure that all personal documentation and kit preparation has been completed correctly. Presentations on the organisation, role and training of 22 SAS. Formal medical examination and advice on subsequent action required to remedy any medical problems pertinent to the UKSF Selection Course. Officer career and pre-course preparation advice. Presentations on the organisation, role and training of the SAS. Conduct of UKSF swim assessment. Assessment of individual field craft, weapon handling and general military knowledge. An individual interview will include advice on the recommended Selection course that should be attended, career implications of a tour with the SAS and pre-course preparation advice. Preparation for Aptitude: candidates for the UKSF Selection course can conduct pre-course navigation and fitness training on the Sennybridge Training Area (SENTA) (Section 7.3). Candidates are accommodated at Sennybridge Camp, were food and safety cover is also provided for 40 personnel in 2-week periods, during a 10-week block of availability prior to each biannual UKSF Selection course. Personnel must apply for permission to conduct Training On Private Land (TOPL). Official training on the hills in this area outside of these dates is restricted to ensure public relations and goodwill is maintained with the private landowners and Forestry Commission who own the majority of the land used for training. A large number of preparation marches are provided by 22 SAS Training Squadron. SAS Infantry Skills Course: the 4-week SAS Infantry Skills Course (ISC) is aimed at non-Infantry soldiers who volunteer to attend UKSF Selection. It is not compulsory, but completing the course enhances the key low-level Infantry skills that will be required. There are four phases, including two phased deployments to the SENTA, where students learn the basics of being an Infantry soldier before working through a patrol and mounting a platoon attack. The course is designed to improve basic field craft and weapon handling in preparation for the Tactical and Jungle Phases of UKSF Selection and is most suitable for those without an Infantry background, including RAF and RN officers and Ratings/Airmen. The course is conducted at the Infantry Battle School (Section 7.4) located in Brecon and overseen by a SNCO from 22 SAS Training Squadron who acts as Chief Instructor throughout. ISC was previously known as the All Arms Infantry Skills Course (AAISC), located at the Infantry Training Centre (ITC) Catterick. Mountain Leader Training: there is an opportunity to attend a Mountain Leader Training (MLT) Course that is run from the Joint Service Mountain Training Centre (JSMTC) in North Wales. A number of these courses are conducted throughout the year and are run over 5-day periods. They are practical in content and concentrate on navigation, although safety in the mountains is covered in detail. Where possible, JSMTC groups together UKSF aspirants. Advanced Navigational Course: candidates should be aware that some Army Units run preparatory courses for those individuals under their command, an example of which is the Advanced Navigation Course delivered by the Household Division and Parachute Regiment Centralised Courses at ATR Pirbright for members of those units. Military personnel may be allocated places on these courses, subject to vacancies. Dates of all SAS/SBS courses covered in this article are published annually in the relevant DIN. Alternatively course dates can be obtained from the Training Wing SBS or Training Squadron 22 SAS. A 1.5 mile (2.4km) run in under 9 minutes 30 seconds. All weights mentioned are minus food (2+ lbs), water (2+ lbs) and personal weapon (9+ lbs). This phase of training will start with approximately 100-200 other rank candidates and 15-25 officer candidates. This phase of training is designed to select those individuals who are suitable for SF training. The initial 3-weeks are devoted to gradual physical training and controlled exercises (cx) designed to develop physical and navigational abilities. All other training during this period is directed at preparing individuals for the fourth and final week which is called ‘Test Week’. Week One consists of runs in the Brecon Beacons, up and down hills with a loaded pack, averaging 4km/h or faster. These exercises, such as the ‘Fan Dance’, are further complicated by navigation and map reading exercises. Candidates will be expected to complete the standard British Army BCFT on the first day and Exercise High Walk on day six. The ‘High Walk’, in reference to the name of the peak and universally known as the Fan Dance (Collins, 2013), is a 14.9-mile (24km) march that takes place at the end of the first week. It is an escorted hill march and is used as the first major indicator of whether a candidate has the physical and mental determination to complete UKSF Selection and candidates have a maximum of 4 hours 15 minutes (as with all assessment marches, additional time may be added for inclement weather conditions). It has also been used on courses run by the Pathfinder Group and the RAF Regiment’s II Parachute Squadron as well as the Infantry Battle School. Candidates are divided into two groups and each starts from opposite sides of Pen y Fan, an 886 metre high peak. One group starts at Torpantau railway station, the other at the Storey Arms Mountain Rescue Centre. Each candidate carries an 18kg (40lb) pack. 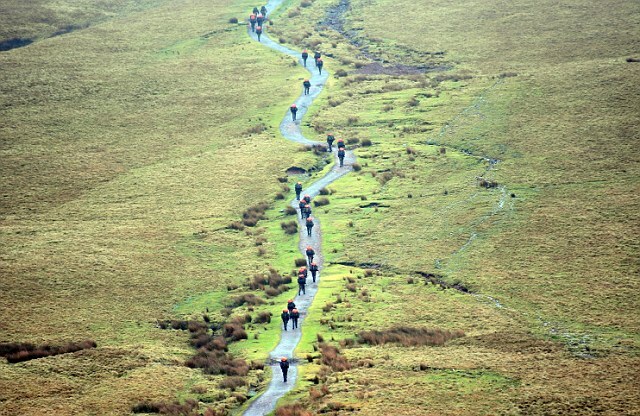 The candidates climb Pen y Fan and descend on the far side, they then turn around and reverse the route. The Fan Dance is distinct from the Long Drag, a 40-mile (64.4km) march with a 25kg (55lb) pack that is the culminating event of the Aptitude Phase. Week Two consists of navigation runs in small groups in woodland areas and night tabs (run/walk with weight), which steadily increase both the physical and mental load on the candidate. Loads increase over the period and the candidate’s personal weapon has to be carried unsupported; candidates are required to keep their personal weapon in their hands as they climb slopes and jog down again. In the third week candidates navigate from a grid reference to other points on the map, in an exercise known as ‘Point to Point’. DS at each rendezvous (RV) point require the candidate to indicate location before instructing the next reference point. Week four, known as Test Week, is the culmination of three weeks of exhausting marches and runs, navigation exercises and putting foreign weapons together (weapon handling). This week consists of five timed marches culminating in a final endurance march of 40-miles (65km) which must be completed in less than 20-hours. The weight carried during Test Week increases from 18.5kg to 25kg for the endurance march. Finishes with an underwater swim of ten metres including a retrieval of a small weight. March 1: a distance of 17-miles (27.3km) carrying an 18.5kg (41lb) pack whilst map reading across open country. March 4: a distance of 22-miles (35.4km) using a hand-drawn sketch map rather than a printed map. March 5: known as the ‘Long Drag’ and ‘Endurance’, a distance of 40-miles (65km) carrying 25kg (55lb) which has to be completed in less than 20 hours. Candidates cannot use trails and all navigation is conducted using a map, compass and memorised grid references (Kemp, 1994). The last day of Test Week is known as ‘Administration (Admin) Day’. From that day all volunteers are attached for administrative purposes to the SBS or 22 SAS. It has been suggested that the failure rate for this phase of training is approximately 50%. Successful completion of Test Week means personnel can move on to continuation training (Phase 2) of the selection process. An article in the Daily Mail (Nicol, 2014), a UK newspaper, in February 2014 reported that the SAS had been ordered by the Health and Safety Executive (HSE) to temper their entry tests (through a Crown Improvement Notice) following the deaths of a number of personnel in July 2013. UKSF aspirants will, according to the Daily Mail, be provided with extra food and water rations (which they previously had to ‘locate’ themselves if they ran out), allowed extra rest and endurance marches will also be shorter; with marshals to help stragglers. Candidates who had to be ‘rescued’ automatically failed. The Daily Mail (Nicol, 2014) article states that the pass rate between the 2013 winter aptitude phase and the 2014 summer aptitude phase had doubled, with UKSF personnel concerned over the quality dilution of trainees as a result of the required changes. The officers on the course face the additional hurdle of Officers’ Week which further thins out the candidates and takes place whilst other ranks candidates are preparing for the SOP and Tactical Training (jungle) phase. The week is designed to identify those officers who display characteristics suited to SF employment. These principal characteristics include integrity, humility, determination, and an aptitude for lateral thought, an ability to learn quickly and a prepossessing personality. This week includes individual tests of determination and planning ability mixed with sleep deprivation and diversionary tasks, their efforts judged by the SAS senior NCOs to whom they have to deliver their Orders. In general, the successful candidate will stand out from his contemporaries. Those who pass the Aptitude Phase (Section 4.0) will undertake an intensive period of instruction and assessment of SF Tactics, Techniques and Procedures (TTPs), including SF weapons and Standard Operating Procedures (SOPs). The majority of this 9-week period is spent in the jungle, an environment that is suitable for SF training and ideal to achieve the purpose of this phase. Much of the training is aimed at discovering an individual’s qualities. TTPs can be taught; the necessary qualities of self discipline, self-confidence, determination, integrity and humour are inborn. The suitability of candidates is assessed by their reaction to, and ability to cope with a series of situations when under physical and mental pressure, and by dose observation by instructors (known as Directing Staff or DS) at all times. Candidates generally underestimate the physical demands of this phase of training and many arrive with a poor standard of basic personal military skills. Previous jungle experience is not necessary; however, a good knowledge of basic field craft and patrolling skills is beneficial. The final test of this phase encompasses these skills and candidates must demonstrate that they can apply these skills in a tactical environment. Surveillance and Reconnaissance Training (2-weeks). Army Combat Survival Instructor’s Course (ACSIC) (2-weeks): those who may have attended a previous course will still be required to pass the entire course again as part of the Selection process. Now part of SERE Training (Section 5.3). SF Parachute Training (4-weeks): takes place at RAF Brize Norton (Section 5.4). Counter Terrorist (CT) Course (3-weeks). Patrol Support Weapons and Squadron Induction Training (1-week). At some point during employment training candidates will undergo SERE (Survive, Evade, Resist, Extract) training which is 4-weeks in duration. SERE training has been based at RAF St Mawgan, near Newquay, since 2008. SERE is an inclusive term (of US origin) that has superseded terms such as Escape and Evasion and Conduct After Capture. SERE encompasses all practical and theoretical measures required to prepare candidates for captivity, isolation and recovery (MOD, 2012). All candidates must attend and pass the 2-week Army Combat Survival Instructors Course as part of SERE training. Candidates who may have attended the course before will still be required to pass the course as part of the UKSF Selection process. The test for this phase of training involves an evasion exercise in which candidates, operating in small groups and wearing greatcoats to restrict movement, attempt to reach a final objective. A Hunter Force from the Special Forces Support Group provides a credible capture threat. Upon capture all candidates are required to undergo a Resistance to Interrogation element, which lasts approximately 24-36 hours. In the event that a candidate does reach the objective without capture, they will still be subjected to this element. Candidates are placed in physically and mentally uncomfortable (stress) positions, deprived of food, water and sleep, and subjected to white noise. Candidates are then interrogated and must only give their serial number, rank, name and date of birth. All other questions must be answered with the stock reply of: “I cannot answer that question”, so that candidates do not provide the interrogators with any sensitive information. High altitude low opening (HALO): HALO freefall insertions allow Special Forces to be deployed from altitudes of 25,000ft or higher, taking advantage of a low radar profile. Only on successful completion of Employment Training will candidates be ‘badged’ as SF, receiving the coveted beige beret with the distinctive winged dagger insignia, and posted to an operational Sabre Squadron within the SBS or 22 SAS. Advancement through the ranks requires the completion of the same promotion courses as the rest of the conventional Army. It should be noted that candidates joining the SBS will conduct additional Boat and Dive training to achieve the Swimmer-Canoeist qualification prior to joining an operational squadron, as discussed below. In a Daily Mail article (Collins, 2013) an ex-SAS officer states that 0%-12% (0-3 of 24) of officer candidates will reach this stage and approximately 10% (21 of 204) of other ranks candidates. In order to qualify as a Swimmer-Canoeist (SC), SBS candidates must successfully complete the UKSF Selection process before continuing onto SBS Selection. Formerly candidates were from the RM/RN, but now volunteers are taken from any branch of the UK military. Those who pass the SC course qualify as a Swimmer Canoeist Class Three (SC3) and are then probationers. Advancement to the ranks of Corporal and Sergeant are predicated on qualification as an SC2 and SC1 respectively. Advancement to Corporal and Sergeant also requires completion of the Junior and Senior Command Courses delivered by Command Wing CTCRM. The Chief Instructor and Training Wing Sergeant Major, a Warrant Officer Class 2 (WO2, OR-8) for UKSF Selection is responsible for the day-to-day (operational) management of the training and selection of potential SF candidates into UKSF, overseeing 11 instructors (a mixture of SAS/SBS personnel) and approximately 300 SF candidates. To support 22 SAS, in order for them to train safely and effectively to meet their operational standards, two Small Arms School Corps (SASC) Warrant Officers are embedded within the Training Squadron. The SASC Weapons Cell consists of a WO2 (QMSI) listed as the Support Weapons SME (primarily Mortars) and a WO1 (SMI) (SAA SME). The SASC Weapons Cell delivers nine different qualification courses for the SAS throughout the year, which they design, resource, validate and instruct on (these are normal bread and butter SASC type courses covered in Brecon, just on a shorter time scale). In addition, the Weapons Cell also provides support to UKSF Selection with weapons training. The SBS Training Wing, based at RM Poole, conducts all training not covered by an SBS candidate’s employment training during the UKSF Selection course. The Sennybridge Training Area (SENTA), requisitioned in 1939, is the third largest military training area in the UK (MOD, 2014a). In 1940 the Training Area became the site of a Royal Artillery Practice Camp. Today it hosts sophisticated live firing and dry training facilities for light forces including light (105mm) artillery. The camp can accommodate up to 1760 soldiers. Canada: 1 training area (three times the size of Salisbury Plain Training Area). SENTA lies in Mid Wales within the counties of Powys and Carmarthenshire. Situated just outside the Brecon Beacon National Park to the north west of the county town of Brecon it covers an area of approximately 31,000 acres (12,000 ha) of MOD freehold land and 6,000 acres (2,500 ha) of land leased from Forest Enterprise. It measures approximately 12 miles (19 km) SW to NE and 5 miles (8 km) SE to NW. SENTA consists mainly of a flat upland plateau known locally as Mynydd Epynt. From this plateau there are spectacular views across to the Black Mountains, the Brecon Beacons, the Cambrian Mountains and the Carmarthenshire Black Mountain. The uplands of the Epynt Plateau lie between the Brecon Beacons to the South and the Cambrian Mountains to the North. The area became famous as the breeding ground for Welsh Cobs – the very name Epynt originating from an ancient expression meaning “haunt of horse”. The geological features consist of Old Red Sandstone in the south and centre of the area, with a band of Silurian shale in the north. Much of the upland area is above 1,250 feet (380 m) with the highest points at the Summit (Grid SN 927434) and the Lookout (Grid SN 961464) at 1,533 feet (475 m) and 1,563 feet (478 m) respectively. Most of the stream valleys lie between 784 – 899 feet (240-275m). The SAS Infantry Skills Course (ISC) (Section 3.4) is one of several courses delivered by the Infantry Battle School (IBS) in Brecon, Mid-Wales, and is part of the School of Infantry. ISC is overseen by a SNCO from 22 SAS Training Squadron who acts as Chief Instructor throughout. ISC was previously known as the All Arms Infantry Skills Course (AAISC), located at the Infantry Training Centre (ITC) Catterick. Besides ISC, IBS delivers trained officers and soldiers to meet the operational requirements of the Infantry, the Army and Defence. IBS conducts realistic battle training for officers who have passed out of Royal Military Academy Sandhurst (RMAS) and for Warrant Officers, SNCOs and JNCOs. This encompasses Phase 2 training for officers (who do not attend the ITC Catterick, but undergo their Phase 1 initial training at RMAS) and Phase 3 training for NCOs and Warrant Officers. IBS has a permanent military staff of approximately 250, including a company drawn from the Brigade of Gurkhas which provides realistic opposition for those undergoing training at Brecon. IBS delivers competent and confident commanders for the Field Army by running command and leadership training, infantry tactics training, weapons training, and live firing range qualifications. It also provides specialist training teams to assist foreign forces in their development, and allocates some places on courses to overseas students. The pay, pensions and service conditions within UKSF differ considerably from those in the remainder of the UK military. This section of the article outlines some of those differences. All officers on completion of a successful initial tour with UKSF may be requested to serve a second tour, return to parent Service duties or serve in a staff appointment within UKSF. This does not apply to those commissioned from the ranks as Late Entry (LE) officers. Officers initially volunteer for UKSF service with a formal request (Section 2.1). Successful officers will take up the appointment of Troop Commander in the rank of Captain (OF-2, or Service equivalent). As no probationary period applies to officers, they will be entitled to receive the officers’ basic rate of RRP(SF) from badging day. There are no changes to officers’ rank or seniority on entry into UKSF. Officers’ careers, including promotion, continue to be managed by the parent Service. Subsequent tours with UKSF are subject to the aspirations of the individual and Service requirement. Personnel serving with UKSF will be appointed to either the SBS or 22 SAS for an initial tour of duty of three years calculated from Admin day (Section 4.4). Other ranks wishing to extend their tour of duty with the SBS or 22 SAS should make a formal application to the appropriate CO.
For the first year from badging day other ranks will be under probation so that their suitability and compatibility in an SBS/SAS Squadron can be confirmed. RTU (Returned To Unit) action during this period is initiated solely by a COs interview, with no further formal administrative action being taken. Senior Ratings, Warrant Officers and Non-commissioned Officers (NCOs) volunteering for service with UKSF will not have the experience or ability to serve in UKSF in their existing rank (although they may merit promotion within UKSF in the future). As a consequence, they will initially serve in the rank of Trooper (OR-2) on joining 22 SAS/SRR or Marine (OR-2) for SBS and their substantive military rank will be placed in abeyance until superseded by SF worn rank or they are accepted for the UKSF Permanent Cadre. Seniority in their substantial Service rank will continue to accrue and those returning to their source specialisation on completion of their first or second tour with UKSF will return in line with their accrued seniority. Rules for subsequent promotion whilst serving with UKSF are contained in the relevant DIN. The CO SBS and CO 22 SAS, in consultation with HQ Directorate of Special Forces and the relevant Service manning authority, may select personnel seconded to SBS/SAS for acting promotion in UKSF units. A ‘shadow rank’ is created which tracks an individual’s normal career path in their parent unit, including incremental base dates and promotion boards, so as not to disadvantage the individual should they return to normal duties in the future. A NCO who is accepted for transfer to the SC specialisation is likely to be required to revert to a lower NCO rank. Exceptionally, should they leave the service prior to being accepted for UKSF Permanent Cadre, normally at the six year stage, their shadow rank will be assessed by the Shadow Rank Assessment Board chaired by the relevant Branch Manager as a basis for pension/terminal benefits (MOD, 2013b). [LINK: BR3 Naval Personnel Management (October 2013 Edition), Part 8, Chapter 91, Royal Marines Other Ranks Promotion, Section 9128 b]. An outline of the career progression path for RM Special Forces personnel can be found here, this broadly follows the career progression for the other Services: RN, BR3, Chap91, Annex 91C. The regulations for recruitment and retention pay, previously known as additional pay or Special Forces pay, are laid down in JSP 754 Tri-Service Regulations for Pay and Charges Chapter 5 Section 5 and Chapter 6 Sections 12 and 15. The rates of SF pay payable are determined by an individual’s SF rank and time in rank. Individuals retain their existing rates of pay throughout the 26-week training phase (28-weeks for SRR). On completion of their training, badging day, personnel enter the SF in the rank of Trooper for the SAS and SRR, or Marine for the SBS, and transfer to the SF Pay Spine, Range 1 (OR-2), incremental level 1 (IL1). Where SF Pay plus (RRP) (Section 9.9) is less than the current rate of pay, individuals will be placed on to a Mark Time Rate of Pay (MTRP) for two years or the period of conversion training, whichever is the greater. The UKSF pay spine is set at a higher rate of pay for each rank than the normal rates set for the remainder of the UK military. SAS, SBS and SRR seniority for pay and yearly incremental progression (YIP) is assessed as SF seniority only, commencing on badging Day, and only include time spent on SF duty. YIP rules will otherwise be in accordance with JSP 754 Chapter 3 Section 4. Note there is no scope for accelerated incremental progression (AIP) for SAS/SBS/SRR personnel. For SRR personnel: RRP (Special Reconnaissance) (RRP(SR)). The level of RRP is based on the number of bounty earning years since badging day. In addition to the appropriate level of RRP(SF), qualified personnel of all ranks filling established posts in the Swimmer Delivery Vehicle Troop will be eligible for the payment of RRP(SF-SDV). SAS/SBS/SRR personnel who have not attained UKSF Permanent Cadre status will transfer back to the normal pay range based on their shadow rank and seniority. Personnel whose SAS/SBS/SRR rank on return to normal duties is higher than their shadow rank, will be assessed for rank and seniority by the receiving manning authority, and will have their pay assessed accordingly by the Joint Personnel Administration Centre (JPAC). SAS/SBS/SRR Permanent Cadre personnel, who no longer hold a shadow rank, would be assessed for rank and seniority by the receiving manning authority, and will have their pay assessed accordingly by JPAC. UKSF personnel are paid under current regulations (i.e. based on timed served in the paid rank within the parent Service and not inclusive of any additional pay). Officers will be pensioned in their paid rank, whilst other ranks will be pensioned either in their substantive rank within their source specialisation, or their promoted rank gained within UKSF, whichever is the higher. On successful badging into UKSF the Return of Service (ROS) for SF training is an initial three year tour of duty to run from the end of Test Week. This will run concurrently with any existing ROS. Personnel who have been badged will be required to waive their right to voluntarily retire/give notice until the completion of three years service from the end of Test Week. If during subsequent training and before being appointed to 22 SAS or SBS an officer or other rank should fail to meet the required standard and be RTU, the restriction on the right to voluntarily retire/give notice will be cancelled. Service with UKSF, for RM and RN personnel, is counted as SEA service for the purposes of drafting and SEA service rosters. A Permanent Cadre exists in the SBS and SAS to provide other ranks with a greater degree of career security, to simplify administration and to assist career planning. Individuals may not join the UKSF Permanent Cadre until they have served for six years. Applications are initiated at the five year point and acceptance is always subject to CO recommendation. Criteria for selection include potential to reach senior NCO rank in SBS/SAS, a proven ability to acquire skills readily and motivation beyond doubt for the length of an applicant’s career. Transfer to the UKSF Permanent Cadre will involve a transfer of Service (for SAS applicants if not Army and SBS applicants if not RN/RM). Transfer to the UKSF Permanent Cadre signifies an acknowledgement by the individual that they understand that their primary career path is now with UKSF. Due to the sensitive nature of their employment all personnel volunteering for UKSF are to be aware that they will be required to sign and abide by a confidentiality contract. Refusal to comply will result in an individual being deemed unsuitable for employment in SF. Full details of the provisions and conditions of the Disclosure Contract are given at UKSF briefings. In March 2013 the Daily Telegraph reported that the UKSF was under threat of spending cuts (Rayment, 2013). The article suggested that UKSF faced cuts of up to 40%, with the axe falling heaviest on the Special Forces Support Group, partly on the SBS (a reduction of 4 to 3 Squadrons) and the SAS left unscathed. The idea behind the then proposals was a return to the pre-Iraq War footing as a smaller, less expensive, but highly capable covert organisation. The SBS “expanded in 2004 to meet the extra requirement for covert missions in Iraq and Afghanistan” (Rayment, 2013). UKSF is open to all male officers and other ranks of the UK military. UKSF seeks to attract determined, highly-motivated, intelligent, reliable and physically fit individuals to serve with both the SAS and SBS. This article provides the basic information to allow individuals to make an informed judgement before applying for UKSF Selection. Chapter 69, Ratings Policy – General Promotion Issues Section 6924. Chapter 91, Annex 91C RM Other Ranks (General Service) and Special Forces – Career Progression Path. UKSF Selection: https://www.youtube.com/watch?v=vKhWntMp7ZE, some of the footage is from the Australian SAS selection documentary ‘SAS: The Search for Warriors’. Collins, T. (2013) Tested to Destruction: An Ex-SAS Officer Reveals the Terrifying Selection Process for Special Forces and Says That, Despite this Weekend’s Tragedy, Standards Must Not Slip… Available from World Wide Web: http://www.dailymail.co.uk/debate/article-2364723/Tested-destruction-Ex-SAS-officer-reveals-terrifying-selection-process-special-forces.html. [Accessed: 03 February, 2014]. Giannangeli, M. (2012) A Secret Army of ‘Amazons’ Guards Olympic Games. Available from World Wide Web: http://www.express.co.uk/news/uk/334450/A-secret-army-of-Amazons-guards-Olympic-Games. [Accessed: 14 July, 2014]. HSE (Health and Safety Executive) (2014) Statement on Joint Police/HSE Investigation into Brecon Beacon Deaths. Available from World Wide Web: http://press.hse.gov.uk/2014/statement-on-joint-policehse-investigation-into-brecon-beacon-deaths/. [Accessed: 28 July, 2014]. MOD (Ministry of Defence) (2012) Joint Warfare Publication 3-66: Joint Personnel Recovery. Available from World Wide Web: https://www.gov.uk/government/publications/joint-warfare-publication-3-66-joint-personnel-recovery. [Accessed: 14 July, 2014]. MOD (Ministry of Defence) (2014a) Public Access to Military Areas. Available from World Wide Web: https://www.gov.uk/public-access-to-military-areas#sennybridge-and-epynt-way. [Accessed: 14 July, 2014]. MOD (Ministry of Defence) (2014b) The Defence Training Estate. Available from World Wide Web: https://www.gov.uk/defence-infrastructure-organisation-and-the-defence-training-estate. [Accessed: 14 July, 2014]. Nicol, M. (2014) Heath and Safety Chiefs force SAS to Soften Entry Test after Deaths of three Soldiers on Training March. Available from World Wide Web: http://www.dailymail.co.uk/news/article-2565717/Health-Safety-chiefs-force-SAS-soften-entry-test-deaths-three-soldiers-training-march.html. [Accessed: 28 July, 2014]. Rayment, S. (2013) Revealed: Nearly Half of Special Forces could go in deepest cuts in 50 Years. Available from World Wide Web: http://www.telegraph.co.uk/news/uknews/defence/9904772/Revealed-nearly-half-of-Special-Forces-could-go-in-deepest-cuts-in-50-years.html. [Accessed: 04 July, 2014]. Scotsman (2005) New Special Force Targets Terror. Available from World Wide Web: http://www.scotsman.com/news/uk/new-special-force-targets-terror-1-706756. [Accessed: 14 July, 2014]. I serve in an Infantry regiment but I’m fascinated by the training process that turn a regular soldier into a SF/SOF operator. All in all, what selection/training appears to you to be the most physically demanding and grueling ? At least in the Western nations ? 1. A very good but very difficult and subjective question to answer! 2. I am going to write an overview of SF/SOF selection and training next year which will hopefully provide an answer to your question. 3. Selection processes do vary. For example, the US focuses on teamwork during the selection phase in contrast to the British where the emphasis is placed on the individual. Quick question re UKSF routes.You seem to have addressed this elsewhere in comments above,but I seek clarification on older recruit entrants in the Army.What happens to someone,for instance, who joins later in life,availing of the 33 years age cap – if by the time they join and commence Phase 1 they exceed the UKSF selection age? Is this career specialisation essentially cut off to them for the remainder of their time in the Forces? I note you have pointed out,traditionally,guys would leave at 40 having completed their 22yrs.How is this changing with older recruits? My understanding is they are capable of also completing a full career? 1. The New Employment Model (NEM) may have some impact on SF recruitment (currently unaware if it will/or has). A. A candidate must complete Phase 1 and 2 training, as well as two years (regimental) duty before applying for UKSF (will usually complete mandatory SAS/SBS Briefing Courses during this time). B. A candidate should be aged 32 years or under on the date of UKSF Selection Course Assembly. C. If a candidate successfully completes UKSF Selection (4 weeks) they will then be administrated by UKSF (aka Admin Day). D. Candidates must then complete SF initial employment training and at least one tour of duty (up to 3 years). 3. If an individual joins at the age cap (33 years) they could complete a 22 year career (earning a full pension) and leave at age 55. 4. In general, 55 is the compulsory retirement age for all officers and other ranks. 5. As noted previously, candidates do receive age waivers, but I unsure of the frequency. 6. For both younger and older recruits whose aspiration is to ‘attempt’ UKSF Selection, then logically the best pathway is the Parachute Regiment due to the nature of their work and training. They provide the most pertinent skills and physical conditioning, as well as being part of the SFSG, to aid candidates in achieving a successful outcome. In terms of physical preparedness for UKSF selection,how much of a lead-in would a candidate for selection need(on average)? What kind of fitness balance is required in the individual, viz. endurance,strength etc.? I’m sure selection has to been seen and experienced first hand to get a full picture,but I’m just curious as to how someone attains this standard? Simple Answer: 6 months to 2 years. Longer Answer: ‘Lead-in’ time would depend on the individual’s circumstances. Candidates with an Infantry background (e.g. Para or Commando) require less time due to the nature of their ‘day job’. However, Combat Service Support (CSS) candidates, e.g. Royal Logistics Corps, require more time as they don’t conduct that type of training with same frequency of Infantry candidates. CSS candidates also usually want to take advantage of the various pre-UKSF courses on offer to develop their Infantry skills, which will also lengthen any lead-in time. All candidates require a high level of strength (for the weight being carried and the hilly terrain), endurance (for the distances being traversed) and speed (they have to travel at a minimum of 4mph with 50lbs on their back). Candidates must maintain this physical effort over a sustained period (4 weeks of the selection phase) and so must be physically conditioned to perform at this continual (and brutal) standard. Physical conditioning takes time (a minimum of 12 weeks) and helps reduce the effects of this incessant physical demand (e.g. injury and fatigue). Risk of injury due to the intensity and duration of the physical demand is an important factor. However, one must also note the impact of ‘silent running’ where staff provide no encouragement or motivation (positive or negative) to candidates. More candidates will voluntarily withdraw themselves due to this rather than injury. Further, fitness levels become somewhat academic within the first week, meaning ‘peaking’ is almost irrelevant – most if not all candidates will be running on pure determination and bloody mindedness to continue. Conventional theories on rest and recuperation go out of the window, 5am starts and midnight finishes, plus other instructional classes ensure rest is kept to a minimum. Would it be possible for a prospective Army recruit to go Regular at 30/31 years of age,completing Phase 1&2 and still get a shot at selection,taking into consideration current service engagements? Is it fair to say the Royal Navy’s SF component share similar age thresholds,criterion etc. given they attend a combined selection event with prospective SAS counterparts. I had heard,I caution anecdotally,a guy going on hills at 38 (doubtless the beneficiary of an age waiver) It seems someone in my position,with ambition to at least train,and attempt SF,is limited. I have been told to look very hard at Reserves? Any advice re above,and more generally,would be appreciated? There are examples of individuals being given age waivers, though I don’t know the frequency. Don’t join the military with sole purpose of joining UKSF, however admirable the ambition. Para’s is probably the ‘best’ route, and they also work closely with UKSF via the SFSG. RAF, RN & RM candidates must meet same criteria as Army candidates. Some argue UFSF Reserve training harder, psychologically, due to stop/start, weekend programme (they do same training/tests fitted around work). 1. My research suggests that approximately 60%-70% of SAS personnel are ex-Para, and SBS is still predominantly Royal Marines (RM). Because of the physical development (PD), skills and experience gained by Para’s and RM (as Infantry) they have an advantage over their CS/CSS brethren. 2. The Royal Engineers (RE), as CS, have an unofficial but recognised pathway to UKSF Selection and also the Pathfinders. 3. For CSS personnel, pathways do not (really) exist; prior to application 99% would not know that a ‘SAS Infantry Skills Course’ existed. 4. With the Briefing Course now only 2-days, down from 5-days, it puts CSS candidates at further disadvantage (the time to really understand what UKSF Selection and life as an SF entails has been diluted). 5. The vast majority of CSS units do not have the type of training required as an integral part of their PT programmes (at a push, you maybe lucky to conduct 1 or 2 loaded marches on top of the yearly CFT). 6. The AACC/AAPPS is not a pre-requisite for UKSF Selection (but would be a good guide for CS/CSS candidates). 7. Land navigation is not taught on the Aptitude Phase of UKSF Selection, and any member of the RAF, RN, RM and British Army can apply for UKSF Selection. 8. With the UK SF Model, personnel have to complete 2 tours and then apply for the SAS Permanent Cadre. Most will retire at 40 having completed 22 years of service. The new engagement models may change this (time will tell). SF Soldiers who meet the criteria can apply for an Late Entry (LE) officer commission the same as any other non-SF soldier. 9. The US SF Model is different. Personnel permanently transfer to their respective SF branch (after completing their initial course of entry), and senior NCOs and Warrant Officers can have 30 years of SF service on their CVs. Could you comment on wider elements of UKSF that are not subject to age limits/restrictions – I’m given to understand(I could be wrong) for example SFC course w/ 18 UKSF is not age capped? Obviously they have a different operational tasking to that of a SAS or SB trained rank,but I’d say their selection is doubtless also attritional? I ask having had a perusal of the above comments,similarly falling into the ‘older entrant’ box! In truth I’ll be 33 in training. It’s a big selling point(as I’m sure it is for many older men and women entering service) that I could still do the full 22 yrs,and get pinged for courses that both interest and are within my physical/mental competency. Finally SRR,for good reason is very hush but any insight as to its age ranges? I’m afraid to say I have less info on SRR than SAS/SBS. Age criteria is there (in part) for career management reasons (although applications are sought from a variety of ages, ethnicities, and gender). My understanding is that bods with Infantry background (i.e. mainly Para’s) will attempt UKSF selection earlier in their career (Pte/LCpl level). In contrast CS and CSS bods tend to try later in their career (Cpl/Sgt level). All UK SF units utilise attrition training. The US has, for a number of years now, completely separated its Assessment and Selection courses from the Training courses (although they may be delivered back-to-back/consecutively); as usual the UK has slowly followed the US lead. Thank you for the excellent oversight of UKSF selection/tours – highly informative! I’m going regular shortly,after several years w/ Army Reserve. At 29 could I expect to volunteer to attend an SFBC following completion of Phase 2,and crucially,prior to my being 32.11 years? You mention prospective candidates should be aged 32 and under when attending SF selection? I have heard(as I’m sure many have) increasingly varying accounts of age waivers,and much older guys going on hills – but in deference to you,am very much open to correction on this? I ask because of my age profile entering Senior Entry training,and where my interests lie. Someone even told me age limits have been discarded for a ‘three years left to serve on engagement’ rule? I realise OPSEC is extremely important,but I’m just asking about eligibility etc. My understanding is that there have been waivers for individuals, on a case-by-case basis, although this is the exception not the norm. Those individuals with less than three years left will automatically have their service extended so they complete three years (SF training is expensive and the MOD wants a return on investment). Best advice is to speak to the respective Training Wing and get a DS answer (numbers from DII). Good Luck! Just had some thoughts on UKSF candidacy. I am hoping to go SF(R) myself,well tip up and give it my level ****ing best! coming on 29 now,and have carefully noted your site content etc. Seems to me both 21 and 23 are hanging out manpower wise,admittedly they’ve cross-decked away from DSF ,but age waivers abound,and what’s more the age ‘goal-posts’ have moved several times as per DIN.Likewise with SB. How is it other nations have no age cap and we do? and where does it leave,for example,someone who goes in,in his 30s but who’s mega switched on? Some would say he needs an equality of arms to go on courses on merit! I think it’s reductionist and limits potential manpower pool. I come from sports/performance background,and there’s so much published data on male endurance peaking mid-late 30s. The age cap is (was) nominally there to cater for the Other Ranks 22-year engagement model. Personnel had to complete 2 tours (2x 3-years after 18/24 months of training) in order to be eligible to apply for the SAS permanent cadre; and then have a SAS career (starting at Sergeant) rather than return to their original Arm or Service. Therefore, if someone started UKSF Selection at 29, completed training, then 2 tours, and then applied for SAS cadre they would be approximately 37, having only 3 years in the SAS cadre. In contrast, the US military SF model has a specific trade (MOS or military occupational specialty) within each Service for its SF enlisted personnel, to which they permanently transfer on completion of the initial selection and training process. The age waiver was introduced to cater for personnel who entered military service later in life. An individual who entered military service at age 28 would still be eligible to complete their 22-years (potentially leaving at age 50), and therefore could still undergo the stages noted above. Commissioned officers, in both the UK and US models, still undertake roles in both SF and non-SF posts, varying between command and staff jobs. Please advise if there is any program to train the SAS for operations in geographical areas where extremely low temperature exists (e.g. Arctic) and where special facilities like toilets, showers etc. are not available? What is the the lowest temperature permitted for such operations? Good question, I will need to make an educated guess on this one. Traditionally, the Commandos have been the specialists in cold weather warfare whilst the SAS ‘specialised’ in hot weather warfare, later encompassing temperate (i.e Europe) and jungle (i.e. Middle and Far East) warfare. The SAS, like any conventional force, would operate from a base (where facilities would be available) and conduct their training ‘in the field’ where such luxuries are lacking! Starting/stopping training due to the weather is determined locally by the training officer based on the local weather conditions at the time, just like any conventional unit.